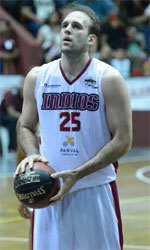 Salta Basket (La Liga Argentina) inked 33-year old American forward Scott Cutley (196-107kg-85, college: CS Fullerton). He played most recently at Atenas Carmen. In 43 La Liga Argentina games in Argentina he recorded very impressive stats: 16.1ppg, 7.9rpg, 3.6apg and 1.2spg last season. A very good year in his career as he was voted to Latinbasket.com All-Argentinian TNA Honorable Mention and League Player of the Week. The previous (2017) summer Cutley played at Colon (Metropolitan) in league where in 7 games he averaged remarkable 17.7ppg, 9.0rpg, 5.1apg and 1.3spg in 2017 season. Among other achievements Cutley's team won Argentinian TNA South Regular Season in 2016. He received also Latinbasket.com All-Argentinian TNA Import player of the Year award back in 2015. Cutley has played also professionally in Paraguay (Libertad), Uruguay (Atletico Welcome) and Argentina (Echague, Boca Juniors, Central Entrerriano Gualeguaychu, Instituto and Obera Tennis Club). He attended California State University, Fullerton until 2008 and it will be his eleventh (!!!) season in pro basketball. Cutley's game is described as: A throwback player who does the little things right on the basketball court ... Played a significant role as a freshman last season, starting five games late in the year ... Is a likely starter at forward this season ... The coaching staff likes his leadership ... Is a feisty player, who is described as a tremendous teammate. Is a a player who has many years of experience already overseas. He is strong guy who is very good around the basket and runs the floor extremely well. Scott is a hard working player, who is described as a tremendous teammate and will do whatever it takes to win.